Those of you who have been following this blog know that I have been spending the last few months engaged in a new photographic series. 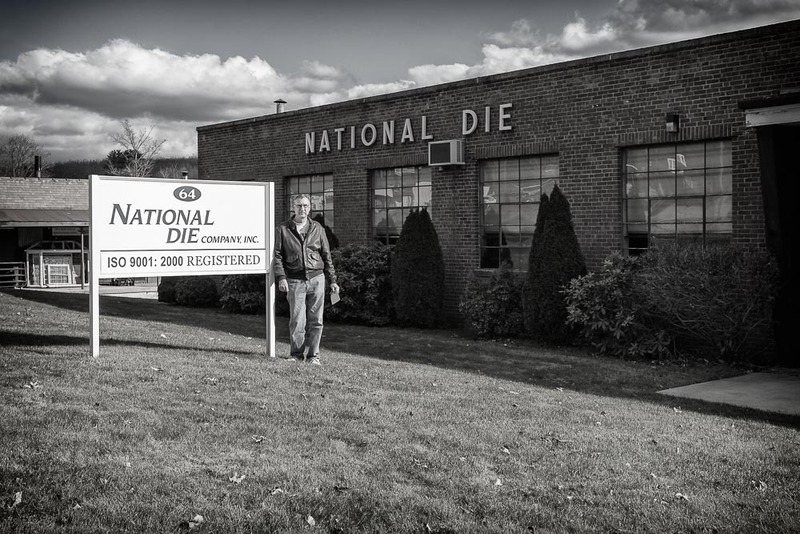 This series attempts to celebrate the concept of “Made In The USA” as highlighted through the day to day operations of the National Die Company , a small tool and die shop. The final three sessions are covered here. The first of the three was an “odds and ends” session. There were a couple of retake photos I needed to make, and a few others I wanted to capture just to round out the more than 1000 photos I took. While there, the Shop team requested a team photo which I was more than happy to take. I decided to have them pose in the middle of the Shop floor, near the Ziggity presses. Front row, left to right, Michele St. Mary, Dave Davino, Mike Mustafi, Al Mustafi, John Ogolik, Jr.
Back row, left to right, Pete Ulinskas, Warren Adams, Paul Cote. I also had each person at the Shop sign a simple model release form which included the fact that I would give each a copy of the book I produced to commemorate their time and participation. Michelle, the office administrator, suggested I also give each person an 8×10 portrait that I captured during the sessions. These portraits, though posed, were created with on-camera flash in some cases, and then cold-mounted on a board, unframed and unmated, to allow for keeping informally at their desk. My objective was not a generic background, head and shoulders shot. 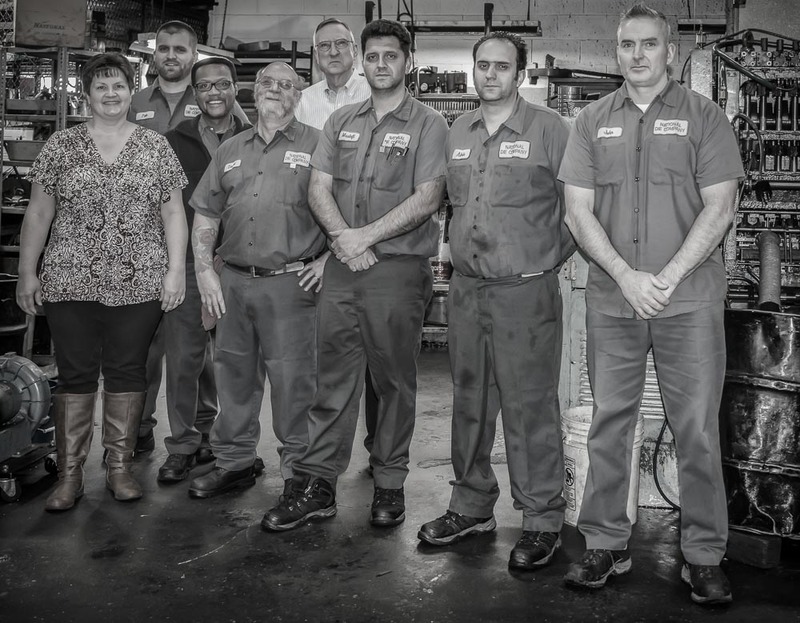 I wanted to capture what I felt was their “Made In The USA” portrait in the setting that was their contribution. For my website, however, I selected 30 images from this listing. I did this to limit the series to a shorter story that I could use for future gallery shows. You can view this shortened series here . I knew I wanted to follow the production from punch and die creation, press operation, quality testing, to shipping. Once I selected the photos I wanted, I then began writing the narratives to accompany each photo to tell the story of the manufacturing process. I also wanted to introduce the viewer to each member of the Shop team and the role each plays in this process. The last two sessions involved proofing the artist statement and written captions. You can read my statement here . I sat with Michelle, the office manager, and Paul, the Shop president, to review this material. Their valuable input allowed me to polish and finalize the narratives. I was now ready to begin my publication layouts. After some research and discussion with members of John Paul Caponigro’s Next Step artistic community to which I belong, I decided to go with Magcloud publishing , now part of Blurb books. In the past, my books had been published as hard covered through Blurb. A major reason I used them was that I did not have to get involved in purchasing an up-front quantity of books and then ship these when purchased. Instead, a viewer on my site is able to click on a book link on my book publications page. This would then bring the viewer to Blurb’s ordering site where I had set up an account which included my markup for each book. Blurb then handled the shipping. Although these books satisfied my overall objectives, prices were high. I wanted a cheaper alternative that would not sacrifice quality but still satisfy my publishing objectives. Magcloud, for me, is the answer. The end result is an 8×8 inch, soft-cover, magazine style book, much like that of LensWork magazine. When my publication process is complete, I will announce its availability in a future blog article. The picture below shows president Paul Cote leaning against the sign in front of the Shop. I had a ball producing this series. I am very proud of what I was able to accomplish. I wish to thank everybody at the shop for helping me with producing this series, especially Michelle and Paul. My only hope is that this end result truly does justice to the National Die team and their dedication to the principle of “Made In The USA”.